Ustu-Khuree Festival of live music will be again visited by the legendary Sun Ra Archestra. Director of the group 80-year-old Alen Marshall and 2 other musicians decided to come back to Tuva after their last year triumph in Chadan. They liked the hearty welcome and open-hearted Tuvan public. Sainkho Namchylak will be also a special guest of the event. The construction of the big factory in Tuva to process sheep hides was started in the beginning of the 90-ties and was perceived as a base for the future self-financement of the republic at that time 80 per cent donated from Moscow. Over 10 years the 'salvation' project swallowed billions of the budget money, but the 'light in the end of the tunnel' was never seen. Young Tuvan actor Eduard Ondar was selected out of dozens of pretenders to play the role of the legendary Chingis-Khan in the film by a Yakut director. 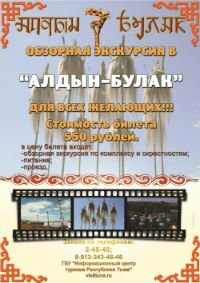 The film is a joint project of the Yakut Ministry of Culture and the 'Eurasia' political party which supported the idea. The overall budget of the film is 8 000 000 roubles (appr 280 000 dollars). Nothing compared to that of the 'Mongolian' (almost 100 000 000 dollars), a joint Russian-Corean-Mongolian-Kazakh new film directed by Sergei Bodrov, which is declared by their Yakut concurrents to be a populist version of the life of the legendary warrior. Sherig-ool Oorzhak has awarded 10 best people of art in Tuva with the State Prizes. Each premium in different nominations carries the name of the most remarkable person in this sphere throughout the history of Tuva. This official ceremony took place for the first time in Tuva. Head of the Government made a personal selecion of the laureates on the basis of the list of the nominees made by a state commission. 'Tibet' festival which took place last year in Moscow was a big success. This year it will be held in one of the most prestigeous Moscow concert-halls – International Music House. Among its participants which will come on to the stage July, 2 are two Tuvan groups - 'Huun'Huur'tu' and 'Olchei' . Special guest of the event is Rock-star Boris Grebenschikov. The preliminary examination of the cause of the bus overturn in which 33 people were damaged showed that it was due to the defect of one of the bus parts and the people were lucky to have a superprofessional chauffeur to drive who skillfully evaded more serious consequences. Several Southcorean second-hand buses were bought by the Kyzyl alexistration to go on the Kyzyl-Abakan route. 'Sketis Music' Moscow record studio has released a new album by Andrei Mongush, a young Tuvan musician, famous as an arranger of the inofficial Tuvan anthem – 'Men Tyva Men' (I'm Tuvan!). The album is titled 'To Be in Honour'. The music presented there is a blend of traditional music and modern trends. Colder than usual summer in Tuva is puncuated by the absence of the hot water in Tuvan houses. Strange as it might seem - Tuva disposing of the huge coal deposits is left without the heat. Central Heat Electrostation is in debt to the coal mine due to the constant debts of Tuvan consumers of heat – organizations, enterprises and ordinary residents. Head of the Tuvan Government and director of the State Hermitage Mikhail Piotrovski decided that the treasures from the the burial mound (kurgan) Arzhan-2 will go on being kept on the Hermitage. Temporarily, while the new building of the Tuvan museum where the artefacts were to be on show is still under construction. In summer 2001 researchers unearthed the richest early Scythian burial site not only in Siberia but in the entire steppe zone of Eurasia. Sherig-ool Oorzhak declared introduction of 11 State Prizes of Tuva in Art and Literature. Nominees are being selected by a state commission. Among pretenders are writers, actors, dancers, stone-covers, singers etc. The names of the laureates who will receive 120 000 roubles (4200 dollars) will have been declared by the end of the year.